Department of Computer Science and Engineering, Oakland University, Rochester, USA. Received October 28th, 2009; revised November 26th, 2009; accepted November 30th, 2009.
program execution over non-standard data domains. possibly obtained when the execution reaches the point. and the abstract domain respectively. number of abstract operations on the abstract domain. crete terms into a domain of abstract terms1. α is an equality theory induced by α.
used to compute success patterns of logic programs. program P can be computed by incremental refinement. -unifiable if they have one or more -unifiers. respect to the equality theory , denoted as . now be defined as follows. be a variant of a clause of P.
computed by a generate-and-test approach as follows. dates elements for are generated from . success patterns are fine enough. is equivalent to to depth 2.
when it is necessary to increase the depth of abstraction. sents an infinite number of terms. k sub-term of t with an _.
Lemma 2 For any , dk is stable. an abstract term from in every possible way. is the extension of to sets of abstract atoms. occurs in at any depth . -unification of X and . algorithm terminates and reports the fact. 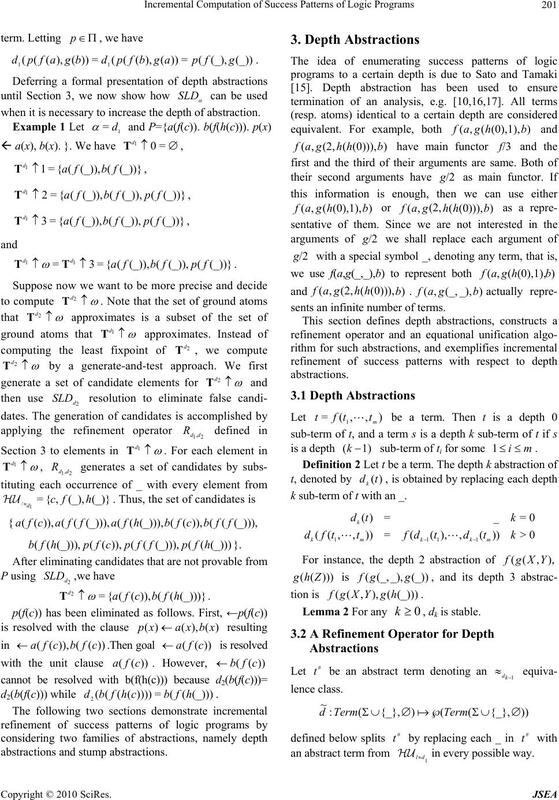 All depth abstractions are comparable with respect to . elements that are not provable from P using . be replaced by any other terms. refutation process is as follows. called stump abstractions, that reflect recursiveness . programs with respect to stump abstractions. Definition 3 Let , and . of t satisfying with . Lemma 6 For any , sw is stable. classes of those ground terms whose main functors is f.
ground terms for a finer stump abstraction. 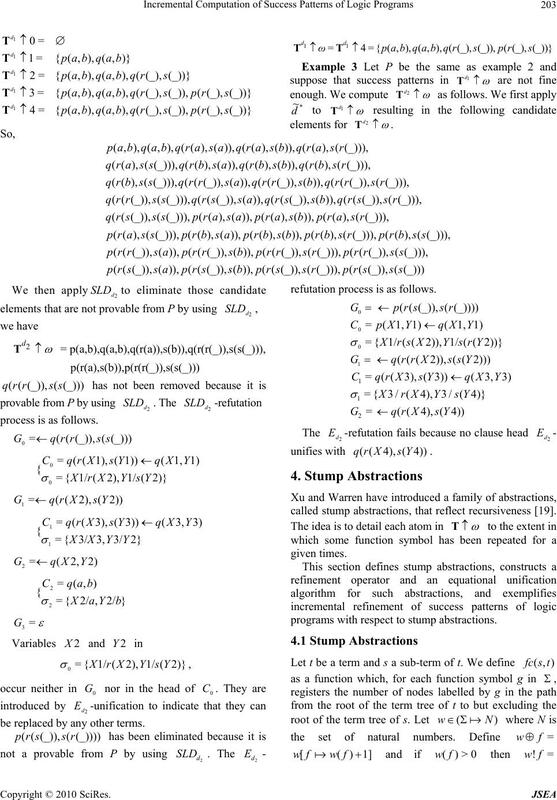 to sets of abstract atoms. 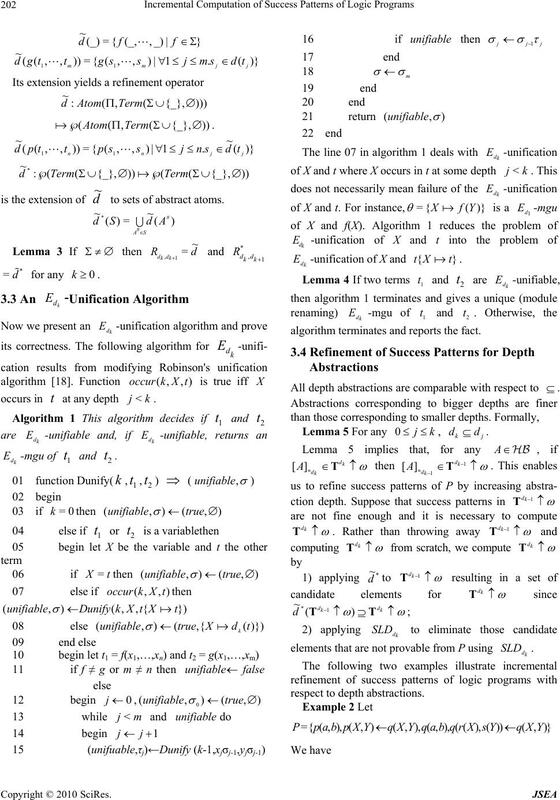 The -unification algorithm is given in algorithm 2.
is true iff X occurs in . -unifiable and, if so, returns an -mgu of t1 and t2. of -unification of X and . .Otherwise, the algorithm terminates and reports the fact. 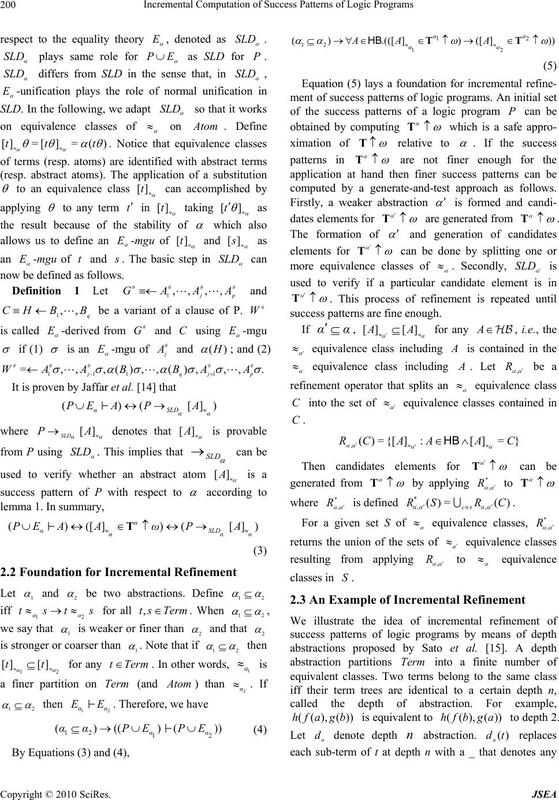 incremental refinement method for stump abstractions. 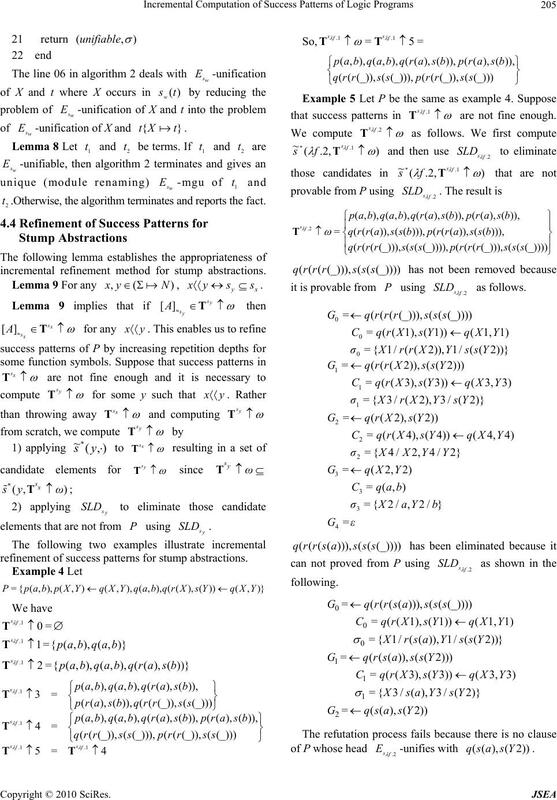 refinement of success patterns for stump abstractions. that success patterns in are not fine enough. of P whose head -unifies with . success patterns of logic programs for stable abstractions. equational unification. The refinement operator is specified. where is the abstraction resulting from refinement. composition of analyses of program modules. Programming Languages, The ACM Press, New York, pp. Programming, Vol. 13, No. 2–3, pp. 103–179, 1992. Vol. 213, pp. 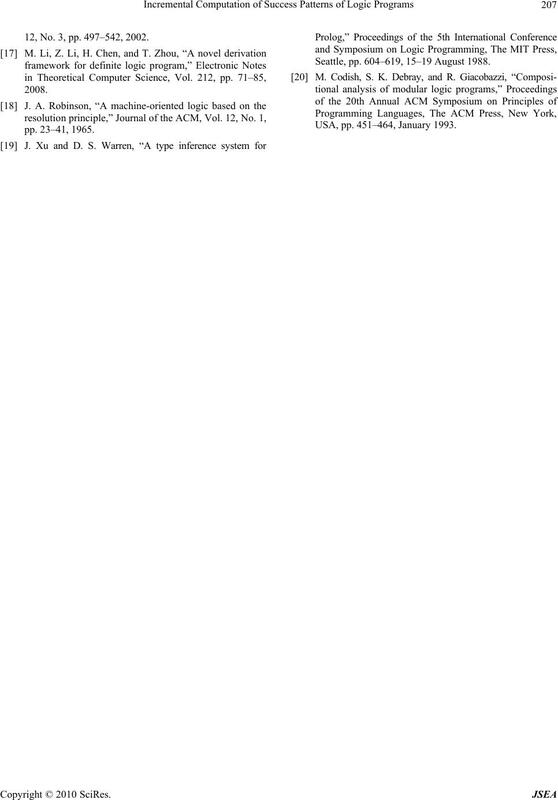 324–338, 1986.
retation of declarative languages, Ellis Horwood Ltd., pp. Seattle, pp. 669–683, 15–19 August 1988. Programming, Vol. 13, No. 2–3, pp. 291–314, 1992. X. Li, A. 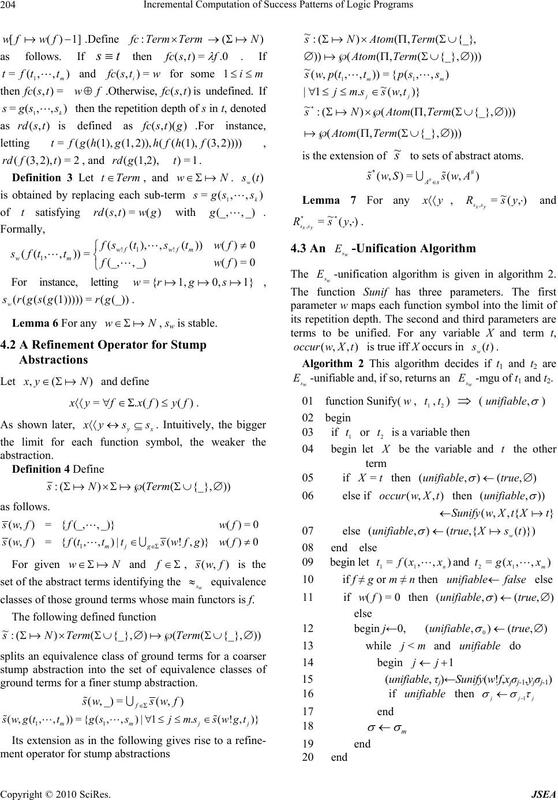 King, and L. Lu, “Collapsing closures,” In: S.
Programming, Lecture Notes in Computer Science, Vol. Programming, Vol. 8, pp. 33–80, 2008. Vol. 16, No. 3, pp. 607–648, 1994. Intelligence, Vol. 23, No. 10, pp. 733–742, 1976. Programming, Vol. 1, No. 3, pp. 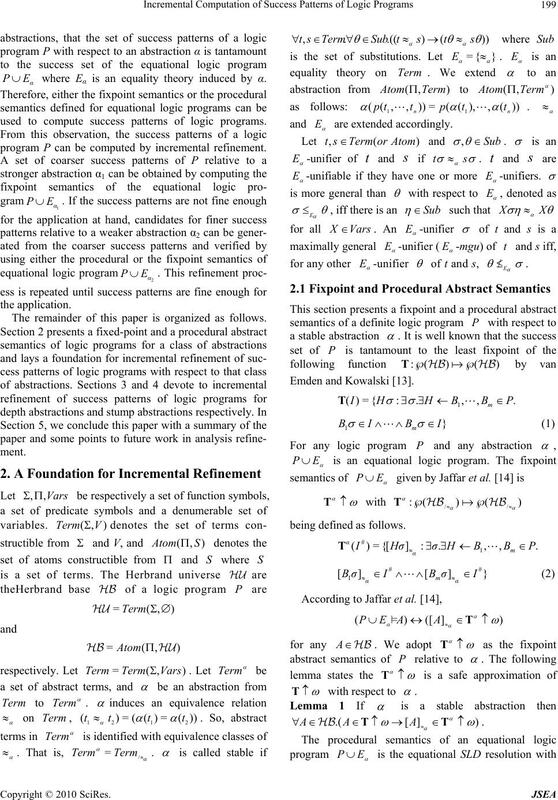 211–23, October 1984.
in logic programs,” Theoretical Computer Science, Vol. 34, No. 1, pp. 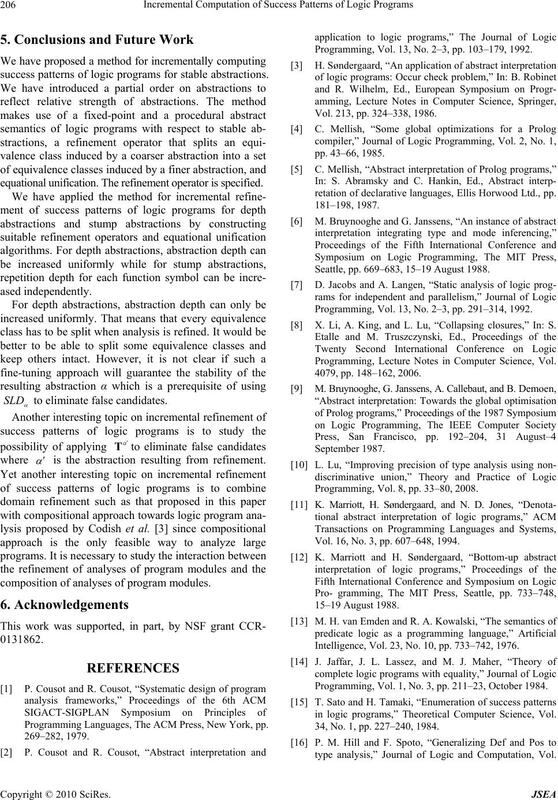 227–240, 1984.
type analysis,” Journal of Logic and Computation, Vol. 12, No. 3, pp. 497–542, 2002. Seattle, pp. 604–619, 15–19 August 1988. USA, pp. 451–464, January 1993.